" '(Their) report is impressive, but it is using meticulously characterized cases with what are probably very experienced clinicians. The problem is one of moving this to the real world outside of academic centers,' where the art of diagnosing varies widely." Earlier research had estimated that 45 percent or more of children currently on the “autism spectrum” would not qualify under a new definition now being refined by psychiatric researchers — a finding that generated widespread anxiety among parents who rely on state-financed services for their children. The new report, posted online Tuesday by The American Journal of Psychiatry, concluded that the number who would be excluded is closer to 10 percent. The finding may soothe the anxieties of some parents, but will not likely settle the debate over the effect of the new diagnosis. All sides agree that the proposed criteria are narrower and will likely result in fewer diagnoses of autism, but until doctors begin using the new definition widely, the predictions of its effect are just that: predictions. The debate has simmered over the past year as an expert panel appointed by the American Psychiatric Association has updated its proposals for the association’s Diagnostic and Statistical Manual of Mental Disorders (DSM-V), scheduled to take effect in May, 2013. 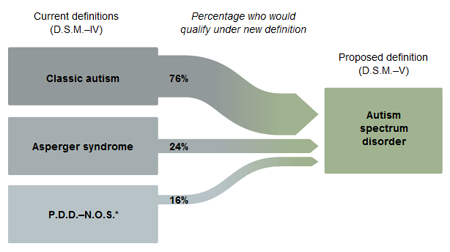 The manual is the field’s standard reference, and several recent studies suggested that the amended autism definition was far narrower than intended. “Everyone has been waiting to see what the impact of the new diagnosis is going to be, and this study is the most comprehensive we have to date,” said Sally Ozonoff, vice chairwoman for research in the department of psychiatry and behavioral sciences at the University of California, Davis, MIND Institute. Dr. Ozonoff was not involved in the research or the debate over its implications. In the study, Dr. Lord’s team analyzed case files for children who received an autism diagnosis under the current criteria, exhibiting six or more of 12 behaviors, like language delays and absence of social bonding or eye contact. The team asked which of these youngsters would qualify under the proposed definition, which requires just three deficits in social interaction and at least two in “repetitive behaviors,” a category that includes hypersensitivities and fixations. The previous studies took exactly the same approach, but Dr. Lord’s group looked at more cases, in greater detail. The records it examined came from three large collections, totaling 4,453 children, with detailed interviews from parents, doctors’ observations or both. “Simply put, we found that the new criteria are quite effective at identifying most children with autism across all levels of functioning and across males and females,” said Dr. Lord, director of the Center for Autism and the Developing Brain, a joint project of NewYork-Presbyterian Hospital, Weill Cornell Medical College, Columbia University Medical Center and New York Collaborates for Autism. The discrepancy between Dr. Lord’s findings and earlier ones may be rooted in the quality of data available, said Dr. Fred Volkmar, director of the Child Study Center at Yale School of Medicine and senior author of a widely reported study presented early this year, with starkly different results. “What they report is impressive in scope and magnitude, but it is using meticulously characterized cases with what are probably very experienced clinicians,” Dr. Volkmar said. “The problem is one of moving this to the real world outside of academic centers,” where the art of diagnosing varies widely. "Objective: Substantial revisions to the DSM-IV criteria for autism spectrum disorders (ASDs) have been proposed in efforts to increase diagnostic sensitivity and specificity. This study evaluated the proposed DSM-5 criteria for the single diagnostic category of autism spectrum disorder in children with DSM-IV diagnoses of pervasive developmental disorders (PDDs) and non-PDD diagnoses. Results Based on just parent data, the proposed DSM-5 criteria identified 91% of children with clinical DSM-IV PDD diagnoses. Sensitivity remained high in specific subgroups, including girls and children under 4. The specificity of DSM-5 ASD was 0.53 overall, while the specificity of DSM-IV ranged from 0.24, for clinically diagnosed PDD not otherwise specified (PDD-NOS), to 0.53, for autistic disorder. When data were required from both parent and clinical observation, the specificity of the DSM-5 criteria increased to 0.63. Conclusions These results suggest that most children with DSM-IV PDD diagnoses would remain eligible for an ASD diagnosis under the proposed DSM-5 criteria. Compared with the DSM-IV criteria for Asperger’s disorder and PDD-NOS, the DSM-5 ASD criteria have greater specificity, particularly when abnormalities are evident from both parents and clinical observation."